The Hilltake Heights project features the 3 BHK apartments situated at Lazimpat (Pani Pokhari), Kathmandu. The ready-to-move-in apartments have 3 bedrooms, bathrooms, living room, dining, and a kitchen. The apartments are fully furnished with all the required household appliances and kitchenware. Started in 1992, the Hilltake Pvt. Ltd. is the multi-industry group aiming the demands, wants, and comforts of every customer personally, ensuring that they are satisfied from the service and products of the Hilltake group. It has been successful to meet with the everyday necessities requirement and the high-tech products ensuring the best quality. At the foothills of Phulchoki, the 95 homes under this project will be built in the area of 120 Ropanis. The whole are is surrounded by lush green vegetation, overlooking the complete Kathmandu valley and the mountains soaring high. With modern houses to reside, free from pollution and chaos of the busy streets, you shall rise every day to look the beauty of sliver shining of mountains. Situated at Thaiba, this spot is a complete blend of natural beauty of waterfalls and rivers, and spiritual vibes illuminating from the nearby Santaneshwoer Mahadev Temple. CE Construction Pvt. Ltd. aims to shine in the pursuit of socio-techno development adhering to its core practices of integrity, honesty, and hard work. Founded in 1992, during its more than 2 decades of work, it has been successful to serve in the sectors like construction, manufacturing, construction management, consultancy, finance, education, health, hydropower, and hospitality, and promises to keep shining on forthcoming days. Staggering views of mountains, lush greenery, and rivers. The project of Downtown Housing Company Pvt. Ltd., Downtown Residency has strongly adhered the mantra of sustainability and environment-friendly living. Located at Imadole, Gwarko, Lalitpur, a total of 68 houses will be built in an area of 25 Ropani. Each home shall be built in an area of 3 Aana and 1 Paisa to 10 Aana, and will be of 2 ½ floors. The ultra-modern and luxurious houses are linked with 20 feet wide black topped double lane internal roads. The common area in the communities shall be powered by solar energy, and each house shall have complete solar back up. Downtown Housing Company Pvt. Ltd. is one of the leading housing company in Nepal that has successfully completed two projects: the City View Apartments at Sanepa, and the Downtown Apartments at Khumaltar. Near to temple, schools, clinics, nursing homes, cafes, commercial and retail zone. Located at 10 minutes driving distance from Sitapaila Chowk, Brihat Community Living is the project of Brihat Investments Pvt. Ltd. It features 76 houses, each with 3 bed rooms and 3 bathrooms to 5 bedrooms and bathrooms. Away from the hustle and bustle of the busy streets, the community living has hilly backdrop, and all the lands are south oriented. Secured by 24 Hr security service, the community residence has provision of appropriate garbage disposal system, and power backup from solar/generator. The houses in the community are linked with concreted interlocking paved blocks. Brihat Investment Pvt. Ltd. is a leading real estate group of the country that has been developing with the moto of “Quality Living for all”. It is committed to promote the real estate investments, partnering for entrepreneurship, and marketing agents. Rain water recharge for conserving water, street lights powered by solar energy, protection against UV rays in windows facing southward, proper disposal system of garbages, and eco-friendly concrete blocks. Electronic security, intercom service, swimming pool, Gym, and Shuttle service. The City View Apartment is another project of the Downtown Housing Co. Pvt. Ltd., situated at Bakhundole, Sanepa, offering you the close proximity with the Kathmandu Valley yet providing peaceful environment. The apartment gives you the opportunity to enjoy the urban and elite community living in the premium luxury residence. The apartments are suitable for professionals, families, executives, business houses, corporate guest houses, expatriate community, etc. There are 38 apartments in this project. Downtown Housing Co. Pvt. Ltd. is a pioneer real estate group led by Mr. Min Man Shrestha who has been pouring his expertise and talents in the real estate sector since a couple of decades. The whole team of board of directors are experts from the fields of banking, construction, hotel industry, supermarket, Information Technology, real estate, engineering, and FMCG. Green landscape, 24 Hr Wi FI, water supply, power supply, CCTV security surveillance, and ATM facilities. Under the lead of the Homeland Properties, Kantipur Colony project features 60 plotted lands surrounded by lush greenery, and boundary wall. The houses in the colony is built in an area of 3 Aana 3 Paisa and 3 Dam to 7 Aana and 3 Paisa. The houses are equipped with 24 Hr security, cable TV, drainage, internet, parking, well, and water reserve tank. 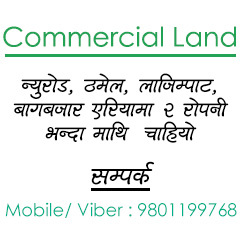 The Kantipur Colony project is one of the largest land project of the company. Homeland Properties is one of the leading construction companies in Nepal that has been working on several projects in Nepal such as the Alkapuri Residency, Nepa Homes, Sipadole Colony, Baneshwor Mall, and Koholpur New City. The Greenhill City Dhumbarahi project is under the operation of the Greenhill City Pvt. Ltd. and is 200 meter away from the Dhumbarahi Chowk. The project aims to build 19 houses in an area of 3.38 Aana to 11.01 Aana. Within the area of the project, which is of 8 Ropani, the 20 feet wide road will feature safe and convenient driving. Situated near to the proximity of schools, hospitals, and other necessary infrastructures, the residency is for all the people dreaming to live in modern and elite environment. Greenhill City Pvt. Ltd. thrives with focus on effective utilization of space, personal supervision, superior craftsmanship, and exemplary finishes. It aims towards continuous growth and improvement via professional expertise, updated technology, innovation, and experience-honed lead. The Sun City Apartments is the project of the Shangrila Housing Pvt. Ltd., which is one of the largest apartment projects, featuring 500 apartments in 5 towers. Located in the peaceful surrounding of Gothatar, the apartments guarantees the security and privacy with optimum luxury resort. It promises to serve the world class luxury with exquisite design and stylish fixtures. The expertise of the company has settled down right to the optimum functionality maintaining the promised modernistic layout. Shandrila Housing Pvt. Ltd. is a landmark name representing the luxury buildings of the first Global Township in the country. The experienced and experts in architecture shall pour their skills that they managed to gather during their work in India with several popular constructions. The company is a group of experts from several sectors like trade, banking, manufacturing, construction, and service industry. Swimming pool, gym, health spa, coffee shop, club, children’s play zone, amphitheater, 75% open area, jogging track, basket ball and badminton court, and proper sewerage treatment plant. Regular supply of water via boring, efficient firefighting system, 24 Hr ATM, cable, Internet, and telephone line. Deep Housing is the project run by the Roadhshow Real Estate that offers you the astounding beauty of Pokhara with ultra-modern and luxurious residence. The projects consists of 108 bungalows, 4 penthouses, and 36 apartments, all designed as per the Vastu. The company has introduced the golf driving range for the first time in Nepal in this project. The whole project covers about 61 Ropani of land, with eco-friendly development, and plenty of space for recreation. Roadshow Real Estate Pvt. Ltd. is a leading construction company in Nepal that has built some of the most popular constructions in Nepal such as the Ranjana Trade Center, Bhatbhateni Apartments, etc. It is currently involved in the construction of several apartment buildings, housing communities, land pooling projects, and so forth. Phase IV Dhapakhel Apartments project is run by the Civil Homes Pvt. Ltd., which is located at the peaceful environment of Dhapakhel. The design and layout of each house offers you the most cost, efficient, and comfortable residence without making any compromise with the functionality and utility. The Block A and B consists of 12 storeys buildings with 160 flats in total. There are about 6 types of houses namely, Type A, Type B, Type C, Type D, Type E, and Type G.
Civil Homes Pvt. Ltd. is a pioneer construction company in Nepal that has been working in this field since more than a decade. With the growing need of secure, comfortable, modern, and luxury houses, it has been successful to win the trust of people. Located at 3 KM away from Jawalakhel, the Baisepati Colony offers you the beauty of nature in the peaceful environment. All of the lands are plotted, and however, despite the developer’s initiation of the construction of houses, you can construct your house as per your own requirement. Important infrastructures like banks, schools, ATMs, hospitals etc. are located near to the project. The colony is equipped with 24 Hr treated water supply, round the clock security, fire-fighting system, etc. 24 hr fire fighting system, round the clock security, cable TV, generator back-up, etc. Located at 2 KM away from the Satdobato Chowk, the Hattiban Housing project is run by CE Construction Pvt. Ltd., offering you with the modern and luxury houses in the peaceful environment. These community houses are located at close vicinity to popular hospital, schools, and ATMs. The housing provides you with 24 hr of water supply, secured and comfortable stay with subtle architecture and luxurious living. Founded in 1992, the CE Construction Pvt. Ltd. is directed towards hard work, honesty, and integrity for socio-techno development in the nation. The company has been working on the projects of several sectors such as manufacturing, construction, consultancy, construction management, finance, health, education, hydropower, and hospitality to keep growing and improving itself. Greenhill City Imadole is another project of the Greenhill City Pvt. Ltd., which consists of 95 houses in the 45 Ropani land. Located at 2.2 KM from the Gwarko Chowk, it offers you with a living room, a kitchen/dining, 3 bedrooms, and 2 master bedrooms. The houses are built in an area from 1900 square feet to 3000 sq. feet. If the client doesn’t’ feel like changing the internal design of the house, the company aims to handover the houses within 18 months from the date of contract. The Greenhill City Pvt. Ltd. aims to shine as a reliable construction company via the proper use of available space, exquisite crafting, and unbeatable finishes. It looks forward for updated technology, creativity, professional expertise, and experienced construction leadership to grow continuously and improve on its own. 24 hr water, security system, cable TV, landline telephone, and internet. The Villa Sunakothi is the project of CG Developers Pvt. Ltd., which provides exceptional homes with rich interior design inclined towards modernization and functionality. A total of 71 houses spread over 25 Ropani of land. Together with modern architecture, the Villa gives you the best look into the lush green environment. The company aims to handover all the houses by October 2017. CG Developers Pvt. Ltd. is the core construction and development real estate unit of the Chaudhary Group, which is managed and directed by collaboration of architects, engineers, and experts of other areas, including the real estate industry. It aims towards sustainable development constructions through its innovation and creative vision and business practice. Located at Ramkot, Nagarjun Municipality, the Padma Colony Phase III is the project of Padma Group. Surrounded with lush greenery, every unit in this project has unique design. Equipped with recreational park, swimming pool, and green areas. A total of 85 units spreads over the 30 Ropanis of land. Its organized planning lets enough space for functionality along with modern shaping and fixtures of the interiors. The Padma Construction Pvt. Ltd. is the subsidiary of Padma Group, heading towards the sustainable development, incorporating the modern technological use, and needs and preferences of clients. The company is guided by the motive to pursue to pursuit of quality and healthy living via its technical expertise and quality manpower. Swimming pool, grocery store, community hall, and other community facilities. Situated at Sanogaucharan, Kathmandu, KL Residency is the project of K L Dugar Group. It is a blend of luxurious lifestyle and world class living. The company offers aesthetic and free functionality with modern amenities in the peaceful, lush green environment. The dream of world class residence, with typical Nepali preferences, isn’t impossible. The project aligns with the Vastu system, and the building codes of Nepal. K L Dugar Group is a leading brand in Nepal representing the best quality. Adhering to the growth as a vision, it has been successful to establish and diversify its network. It is always looking forward for ways to improve, and diversify its business interest for more projects.